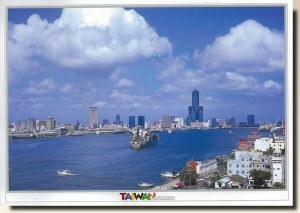 Kaohsiung is the most densely populated and the second largest city in Taiwan, with a population around 1.5 million. It is a center for manufacturing, refining, shipbuilding, and other light and heavy industries. A major port, through which pass most of Taiwan's marine imports and exports, is located at the city but is not managed by the city government. An international airport, the terminal of Sun Yat-sen Freeway, and the railway stations of Western Line and Taiwan High Speed Rail, are also located in Kaohsiung. The city is also home to Taiwan's navy [wikipedia].